I'm working on a TAPR project called the Clock-Block. It's a simple synthesizer designed for applications like controlling the frequency of a PC's clock for timekeeping purposes. This page has some info about the ICS525 programmable clock synthesizer that is at the heart of the design. NOTE: The production board will look a bit different than this. Among other things, the two rows of headers have been replaced by two DIP switches, two mounting holes have been added, dual supply (3.3 or 5 volt) operation is supported, and traces are provided to install an optional divider that allows use in the audio to LF range. 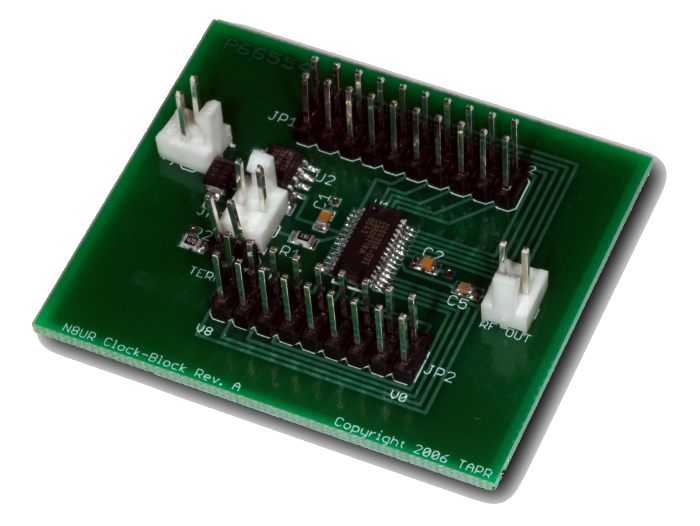 The ICS525 is a versatile chip that accepts a clock input from 2 to 50MHz and can produce an output frequency from 5 to 250MHz (using the -02 variant). It's designed as a clock for timing, and not as an RF synthesizer. Set to operate in "lowest jitter" mode with a 10MHz input clock and programmed for 200MHz output, all non-harmonic spurs are >50dB down. 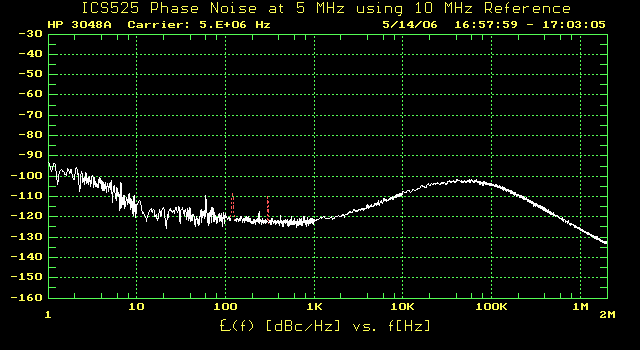 Even harmonics and subharmonics tend to run between -50 and -60dB. As you'd expect from a square wave output, the odd harmonics are not much attenuated. 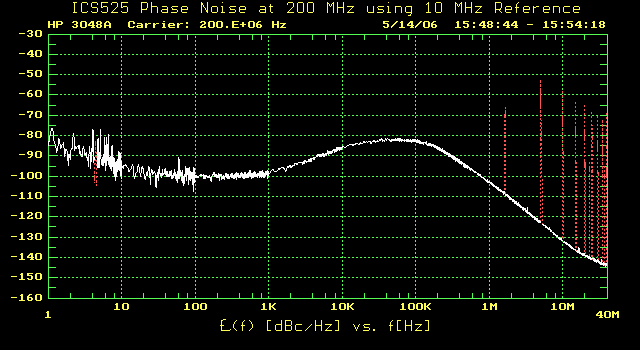 Running at 200MHz, the third harmonic at 600MHz is only down -11.5dB, while the 5th harmonic at 1GHz is down -20dB. 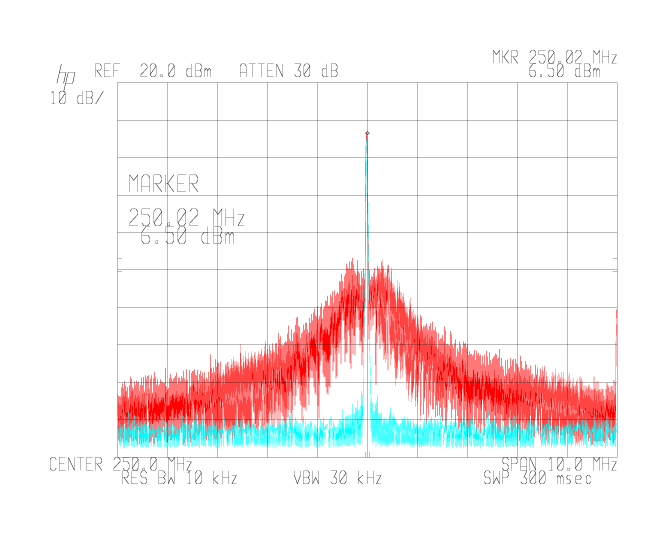 With a 20MHz output, the 3rd harmonic is -10dB and you have to get to the 23rd harmonic at 460MHz before you hit -30dB. The ICS525 comes in 2 variants (there are actually more, but they don't seem to be readily available. The -01 is a lower performance device; the -02 has a higher operating frequency and less jitter. 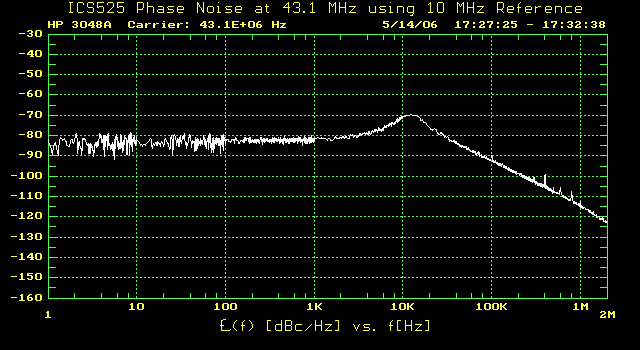 The plot below shows noise out to 40MHz; all the other plots go out to 2MHz (due to measurement limitations at lower frequencies). 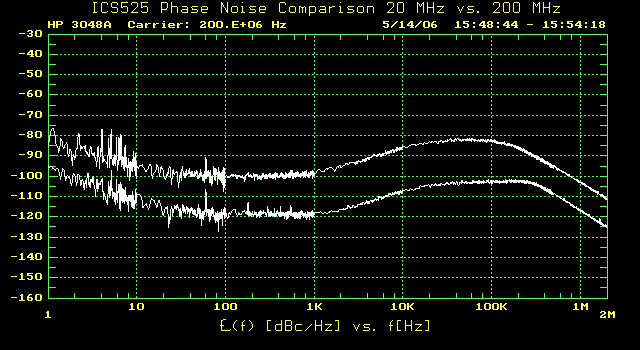 Comparing two output frequencies an order of magnitude apart shows that the phase noise reduces about 20dB. Following is an example of a very different noise signature. In this case, the divisor ratios were much more complicated than in the other examples, and in particular the R (reference) divider was set to 25; the other frequencies did not use the R divider. The chip uses three dividers, denominated as S, R, and V. The divisors are set by parallel pins with internal pull-ups. That means by default the pins are set to 1; to set a zero, ground the pin. Don't make the mistake I did and assume in the programming charts below that a 1 means to install a shorting block! Brooke Clarke's Battery Top Signal Generator page has some really good information about programming the ICS525. Brooke believes, and it makes sense to me, that for lowest jitter you want to use the divisor combination that has the highest output ("S") divisor; if there's a tie, then pick the lowest VCO ("V") divisor. If you want to do it the simple way, there's an ICS525 calculator at the ICS web site that will show you the divider settings for a given input and output frequency. Note that it asks you to specify the permissible frequency error; the chip doesn't have unlimited resolution and some frequencies cannot be generated precisely. Also note that the generator won't let you enter input or output values outside the specified range for the chip; Brooke has shown that you can go quite a bit outside that range if you're willing to work out the divisor settings manually.